BMA helps clients integrate planning across demand, supply and finance. We have developed custom solutions for large Utility companies, Manufacturers, Supply Chain firms and Cash Management organisations. Our solutions help companies create feasible, optimal plans, prepare for the unexpected and rapidly create the optimal response when change inevitably occurs. Unlike the majority of planning and analytics software, BMA’s solution has been designed specifically for the business user. It enables you to uncover hidden insights across all business silos by combining the power of collaborative scenario planning with the most advanced optimisation capabilities on the market. It is easy-to-use, intuitive and able to uniquely display opportunity values across all silos. BMA puts prescriptive planning capabilities into the hands of business decision-makers. Knowing the optimal course of action brings unmatched value to the planning process while helping build trust across business silos. BMA’s advanced modelling software enables multi-dimensional business hierarchies to be modelled. Furthermore, simple workflows and automated notifications allow decision-makers to quickly review and approve plans within the application. 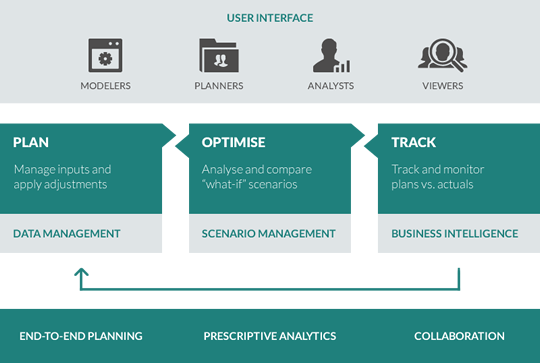 Scenarios can be created and analysed through unlimited What-If Analysis. All scenarios are based on certain business objectives or assumptions that help created an optimised plan and associated playbook that is shared across an organisation. Plan for the unexpected or rapidly create the optimal response when change inevitably occurs. BMA’s embedded financial intelligence represents costs as they actually occur versus simply taking an average. There’s no such thing as perfect data. BMA allows you to analyse the impact of uncertainty on your business and create risk-tolerant plans. Users can define and apply different probability distributions to critical model variables like resource reliability, demand, currency exchange rates, input costs etc. This approach to modeling risk enables users to analyse the impact of unpredictable events on operational and financial performance while simultaneously optimizing the company’s response. Prescriptive Analytics translates a forecast into a feasible plan for the business, and helps users identify the best steps to implement. Optimisation supports ongoing operational, tactical and strategic business planning; it leverages linear programming to identify the best outcome for a business, given constraints and objective function. When applied to broader tactical (e.g. S&OP or Integrated Business Planning) or strategy planning scenarios, the optimisation model is used to calculate the impact of various forecasts on the business. It does so while also taking into account operational realities in the form of constraints.